A milkshake is a heavy creamy drink that is often used as a dessert. Once you blend any fruit or vegetable with whole milk, it becomes a milkshake. Milkshakes are the perfect drink for a hot day. You can blend the following in any proportions and come up with a delicious strawberry milkshake. I listed vanilla ice cream and Greek-style yoghurt as optional because all you need to make a strawberry milkshake are the strawberries and the whole milk. But these other 2 ingredients make the milkshake thicker and more delicious. I either use vanilla ice cream or the Greek yoghurt, I never add the 2 at the same time. But you can if you wish. Please note that the milk used here is whole milk and not evaporated milk. You can buy whole milk from any big supermarket anywhere in the world. Some poeple use skimmed and semi skimmed milk but those do not make creamy milkshakes. 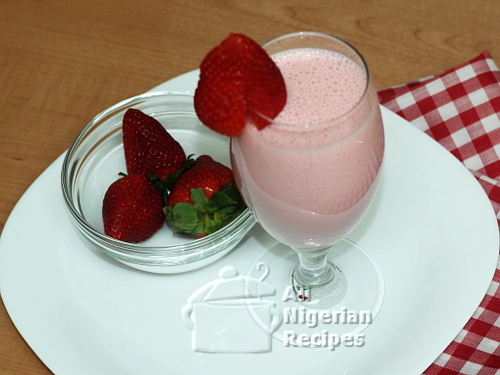 Strawberries when in season, are available in Nigeria (in Shoprite, SPAR) and supermarkets all over the world. Greek-style yoghurt is also available in major supermarkets all over the world. To blend it, you'll need a kitchen blender. Any blender with a minimum of 500W can do a good job of this. 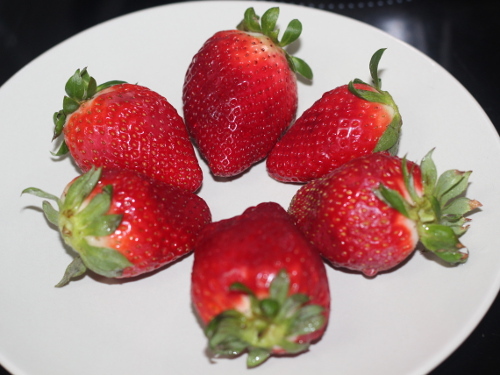 Wash, trim and cut the strawberries into small pieces and place in your blender. Scoop some vanilla ice cream or Greek-style yoghurt (if you are using any of these) into the blender. Turn on the blender and start pouring the whole milk through the peep hole of the blender cover till you are happy with the thickness of your milkshake. Serve on its own, with cookies or with whole strawberries.